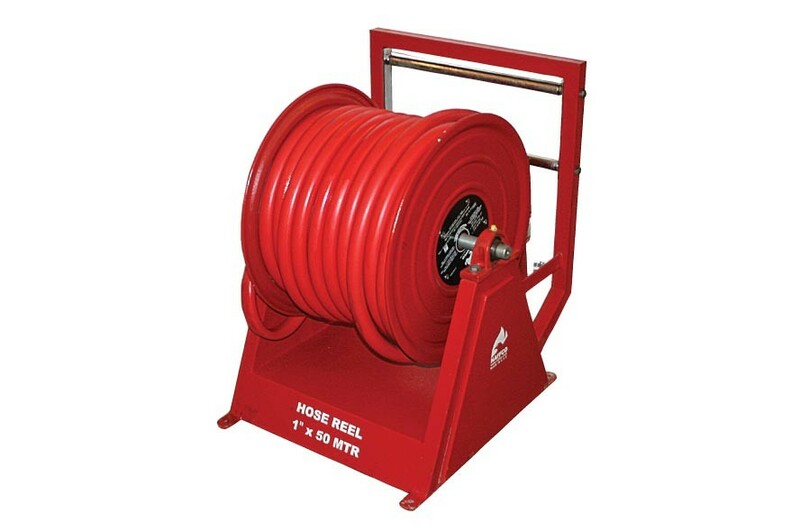 NAFFCO hose reel with foam tank is a complete fire fighting unit with 30m of 1.5” hose, connected to a variable foam inductor fed from a stainless steel tank. It is designed for use with AFFF synthetic foam concentrate, or with Environment friendly FFFP. It is an ideal unit for fighting fire in chemical and petro-chemical plants. Manufactured as per BS EN671-1 standard. Hose reel discs are manufactured using 1.2mm electro galvanised steel sheets and has ribs that gave extra strength, which in turn avoid twisting. Plastic nozzle supplied has jet/spray/shut-off operations. Chrome plated brass nozzle is available upon request. Hose has working pressure of 12 bar and bursting pressure of 50 bar and it is red in color, black color also available upon request. Inlet stop valve 1” size in made of brass and finished with chrome. Brass finish available upon request. Each unit is hydrostatically tested at 18 bar. For fixed hose reel, a hose guide could be supplied upon request. Swinging hose reel is mounted on an arm which swings 180° and the hose can be run out in all directions without a hose guide. In automatic models, the valve opens automatically within three revolutions of the reel. 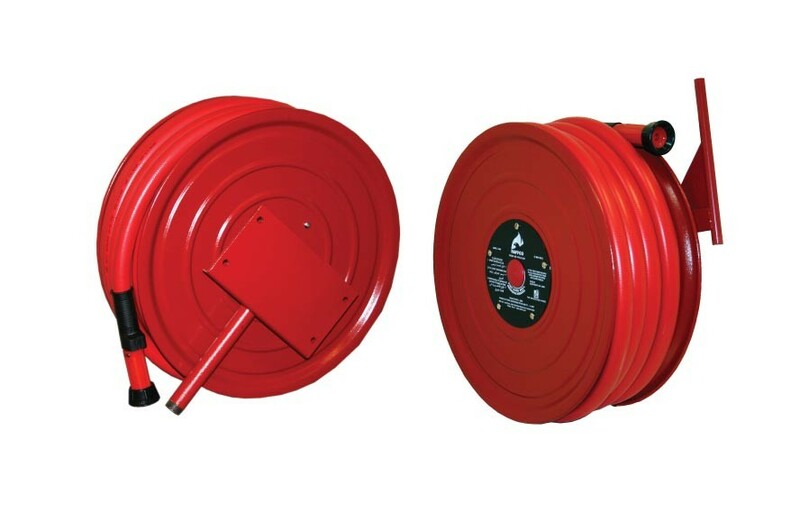 Fire hose reel is an efficient and reliable fire-fighting unit suitable for use in all types of buildings. The water is supplied through the center of the reel, so the unit is always ready for immediate use. 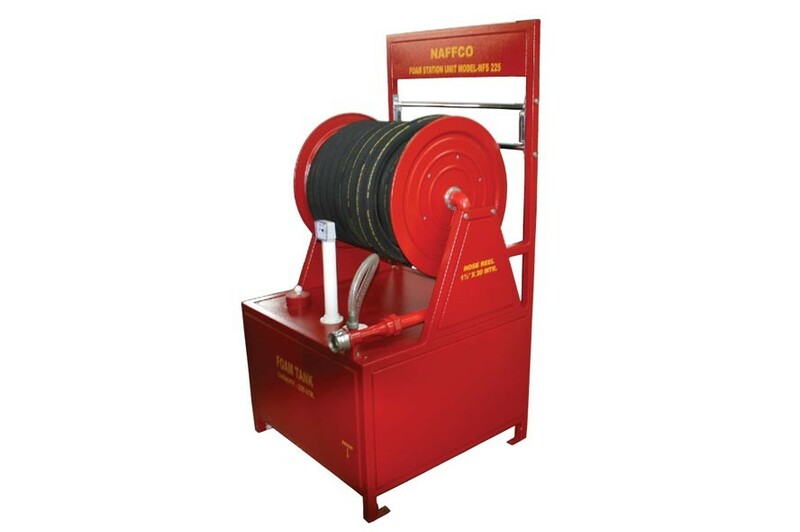 NAFFCO heavy duty hose reel is designed for used in manufacturing plants, warehouse, etc. It can be mounted on wall or on ground and is equipped with a special hose guide.